Your spine is made up of 24 vertebrae. Between each vertebrae are your discs. I often describe to my patients the consistency of your discs is a bit like a jam doughnut. As in they are tough round the edge with a softer centre. What happens with a disc prolapse (herniation/bulge) is a tear appears in the tough part that allows the soft centre to move and create a bulge. This bulge can then press on structures around the spine such as nerve roots which would create pain. I often hear patients tell me they have 'slipped a disc' and so i will explain to them it isn't actually possible for your discs to 'slip' think of it more as a bulge, prolapse or herniation. The disc will more often than not prolapse backwards and to one side (this is why you might get pain down one leg - sciatica) there can however be lots of reasons why you might get sciatica. Seeing a physiotherapists will help diagnose the correct reason. Disc prolapses are actually very common. It is thought that a large percentage of the population have them without any symptoms. 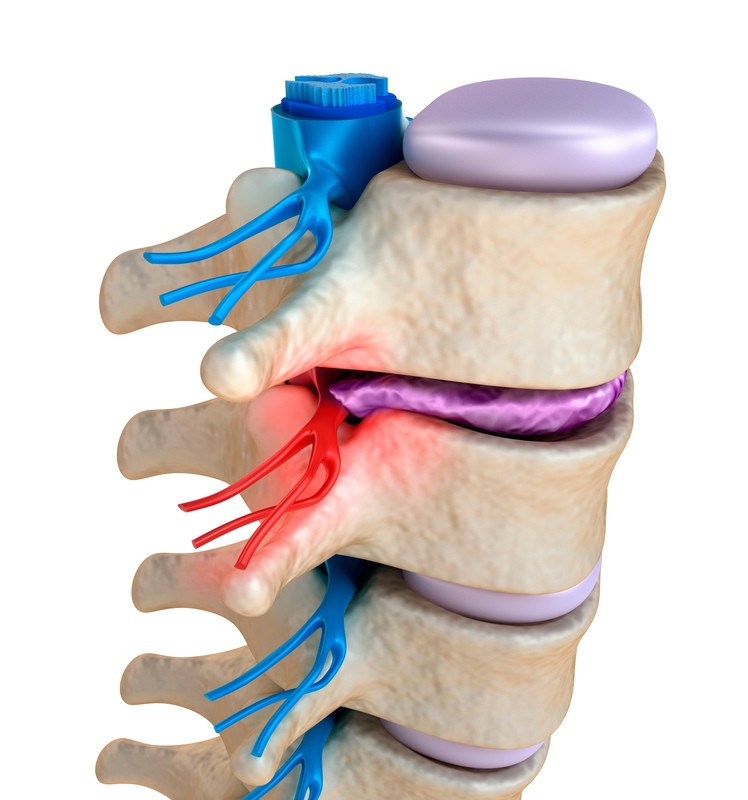 They occur most commonly in the lumbar spine between the L4/L5 vertebrae and the L5/S1 vertebrae. They can also occur in the cervical spine (neck) and less commonly in the thoracic spine (middle back). If you have a disc prolapse we have some specific workouts designed to target this problem. Take a look here.